The Ox-Bow Incident is a Western with a simple plot that takes a critical look at capital punishment, following a posse from a backwater town in Nevada who are hellbent on seeking vengeance for the murder of a local rancher. Our hero is Gil (Henry Fonda), a cowboy who is ambivalent about the ethics of the posse’s brand of justice. 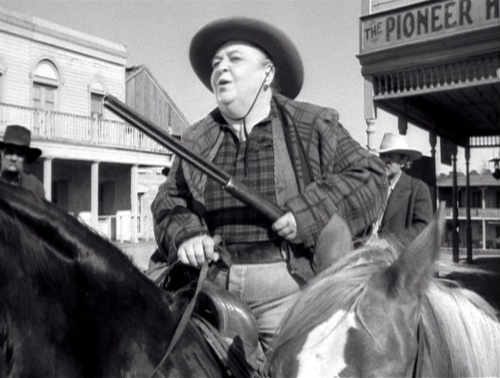 The posse forms a motley crew, one of whom is Jenny “Ma” Grier (Jane Darwell), a fat women who is well-liked by the others. She is outside binary gender categories. The town is characterized in the first scene as lacking women; which is both denied and reinforced by her presence and appearance. Her nickname ties her to womanhood, but when the judge balks at her wanting to be part of the posse because of her gender, she and the others laugh at him. She is asked to cook for the men on the trail– despite the fact that most, if not all, of the men in the posse are able to cook a meal over an open campfire– but also volunteers to take an active part in the hanging of the posse’s suspects, “if no one else will.” As she says this, she looks around at the others in the group, wordlessly accusing them of being sissies. In stark contrast to Ma is Gerald (William Eythe). Gerald is coded as queer; his father Major Tetley (Frank Conroy), formerly of the Confederate Army, is the sternly vicious leader of the posse, and demands that Gerald come along in an attempt to “make a man of [him].” Gerald is sickened at the sight of blood, and tries to oppose hanging the suspects without a fair trial. Ma is a great example of the layered politics of representation. She’s a fat, gender nonconforming woman who is respected by the other townspeople, speaks her mind with confidence, and effortlessly laughs off sexist comments. It would be easy enough to join Team Ma based on these components, but paradoxically, the degree to which she blends in with the majority of the posse makes it impossible to admire her. Her seeming ability to overcome marginalization doesn’t excuse the unethical nature of her choices in the film. I saw this film pretty soon after reading Tasha Fierce’s great essay The Revolution Will Not Be Plus-Sized, which describes a real-world parallel: by demanding that mainstream clothing lines offer a greater range of clothing sizes, fat people are making a political goal of (further) assimilation into an industry that thrives on exploitative labor practices and “the cultural push to appear normative.” When we demand respect and representation, does that mean we have to compromise ethical stances in deference to the status quo of the oppressive group in order to get what we need?